Got a lot of holiday parties on your calendar this month? There are plenty of good reasons not to over-indulge at the punch bowl, especially if you plan to drive yourself home afterward. Not only is impaired driving extremely dangerous to you and others on the road, but a Driving Under the Influence (DUI) ticket is costly. A study by the personal finance site NerdWallet shows it's more costly in some states than others. It should first be noted that alcohol was a contributing factor in 41% of fatal crashes on New Year's Day in 2015 and 44% on Christmas last year. The National Highway Traffic Safety Administration (NHTSA) says speed is always a major factor, and an impaired driver is more likely to have a heavy foot. When a police officer pulls you over and tickets you for DUI, you could face a lot of unpleasant consequences, including an expensive fine and even jail. Should you be in an accident where alcohol was a factor, you could face more serious criminal charges and even higher fines. But NerdWallet says there is another financial cost of a DUI ticket – what it does to your insurance rates. Nationwide, just one DUI conviction will raise your auto insurance rates an average of 62%. If you're speeding, tack on another 14%. North Carolina is the toughest state on drunk drivers. 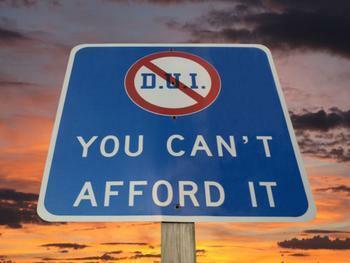 There, a DUI conviction can raise your insurance rates 362%, from $872 to $4,077 a year. A simple speeding ticket can make your rates go up 62%. At the other end of the scale, a DUI ticket is less costly in a handful of states. In Louisiana, rates will go up around 17%. The same infraction in Maryland will raise rates 19%, and in Utah the mark-up is around 21%. The authors of the study point out that you might not see the rate hikes immediately. Rather, they'll show up in your bill when your policy comes up for renewal. If your license is suspended after a DUI conviction, keep in mind that your insurance company might not even give you the option of renewing it. So during holiday merry-making, it's always prudent to limit your alcohol intake, or use a designated driver, taxi, or ride-sharing service to get home.